They were a company without a champion, and all of that was set to change at WWE's Money in the Bank, shown live in the early hours of this past Monday morning on Sky Sports here in Britain. The show began with the first title match of the evening as Bray Wyatt's boys Luke Harper and Erick Rowan challenged Jimmy & Jey Uso for the Tag Team titles. This one certainly ticked all the right boxes. As far as show openers go it was a pretty decent speed versus power battle, although I'm not exactly sure if I can call it that with some of the things that Harper pulled out of his bag. The action was great from the outset. Both teams put in good showings, and the match really came to life when the Wyatts took control and used Jimmy as their personal punching bag. It was during this period that once again I couldn't quite believe that Luke Harper was the same Brodie Lee guy who looked so crappy in Ring of Honor a few years ago. Perhaps the best moments in this match came during the all hell breaking loose segment. Not only did we get to see some quality high flying from the brothers Harper also troubled the air traffic controllers. It really was a good showing from the big boys. But while it seemed that countless thousands really wanted the bearded ones to win it just wasn't meant to be. After the brothers foiled Rowan's attempt at a top rope move they took him down with a double superplex. They then went back to the top rope and came down on the big man with one superfly splash after the other to get the title retaining pin. Nice work all round. Damian Sandow.....I mean Paul Revere was up next, taking on Adam Rose. Gimmick-wise this match was out there. Sandow is better than this, while Rose is definitely an acquired taste, and it's a taste that I don't think I'll ever get used to. The action was okay, but this was definitely the filler material of the show, with a lot of action filling up so short a time, and Rose taking the win after his ace crusher-like move. Then it was on to the first Money in the Bank ladder match, with Seth Rollins, Rob Van Dam, Zeb Colter guy Jack Swagger, Dolph Ziggler, Kofi Kingston and Dean Ambrose fighting it out for a shot at the gold. Thrills and spills were the order of the day in this particular encounter. There was an absolute ton of great moments here, and it was made all the more intriguing by the rivalry between Rollins and Ambrose. RVD looked great early on as he pulled out all the stops. He definitely seemed right at home in this environment, although it was quite interesting that he got the "you still got it" chant. Maybe he lost it during his TNA stint. We had quite a few Joey Styles OMG-like moments here (or should that be Michael Cole-like oh my lord moments?). They began when Kingston was pushed off the ladder and landed feet first on the top rope before taking those on the floor out with a big dive. Then there was Swagger power bombing RVD off the top of the ladder, with Ambrose superplexing Rollins off the top of the same ladder just a few seconds later. Ambrose was taken out of the match shortly afterwards when he suffered a shoulder injury after taking Swagger down with a DDT. The doctors couldn't keep him out for long though, because just when it looked as if Rollins was about the grab the case Ambrose raced back down to the ring and stopped him. Sadly for Dean his moment of glory never came. Ambrose looked set to capture the case when the demon Kane appeared on the scene, and after stopping Ambrose from taking the case he added insult to injury by taking him down with a chokeslam and finishing him off with a tombstone. This left the way open for Rollins. With everyone else out of the match Kane held the ladder while Rollins climbed to the top to claim the big prize, a guaranteed title shot with the next year. Afterwards Mr. & Mrs. Triple H came out to celebrate their new guy's win. It was back to tag team action for the next match as Curtis Axel and Ryback went up against Goldust and Stardust. They say first impressions are everything. Well, if that's the case then the Rhodes brothers could become my new favourite tag team. Although I'd seen photos of Cody's new gimmick, but now I've seen him in action I have to say that I was pretty impressed. This was a nice little match, the proverbial short and sweet encounter. Stardust looked good early on as the Dust boys put together some nice moves before the former Paul Heyman guys began to use Goldie for target practice. Those two really are starting to gel as a team, and maybe soon they'll be rewarded with a title shot or two. Back to the matter at hand. Goldie avoiding Ryback's meat hook clothesline and getting the hot tag to Star signalled the beginning of the end. Once again the younger Rhodes looked refreshed as he took it to both of his opponents, with a little help from his big brother, and after Axel accidentally clobbered his partner Star rolled Ryback up for the three count and win. Axel was none too happy at the manner of the defeat, although his post-match attack led nowhere when the Dust brothers took him down with a flapjack into a DDT. The battle of the big men followed as Rusev, accompanied by Lana, met Big E once again. This was kind of how I expected it to be, two big guys beating on and throwing each other around the ring, and in it's own way it was quite entertaining. Both guys put in credible performances, and once again the transplanted Russian came across as one for the future. The best moment of the match came when Biggie went flying through the ropes and speared Rusev from the apron to the floor. It was the closest he came to getting the win, because when the action returned to the ring Rusev regained control after a couple of kicks before locking in his camel clutch variation the accolade. Biggie tried to fight it for as long as he could until the inevitable happened and he tapped out to give Rusev the submission win. With Fandango as the special referee we then saw something we haven't seen on a WWE pay per view for ages, a second Divas encounter as Summer Rae took on Layla. The battle between the dancer's ladies was definitely the filler material of the evening. It wasn't that bad I suppose, but it says a lot about the match that the best thing about it was JBL's references to referees from the old World Class territory. Thankfully the end came quickly when Layla kicked Summer in the head to gain the winning pin, and Fandango's affections afterwards. 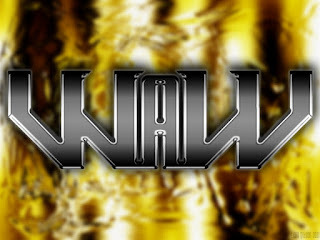 The main event was the second Money in the Bank ladder match, with United States Champion Sheamus, Bray Wyatt, Alberto Del Rio, Paul Heyman guy Cesaro, John Cena, Roman Reigns and Kane fighting it out for the vacant WWE World title. This one certainly had a lot of star power, and a rather interesting storyline, with Kane added to the mix to run interference for the Authority's chosen one Orton. It made for a very good encounter, and although there were no real stand out performances all eight men put in a good showing. But despite the good performances I have to admit that I found the briefcase version a little more exciting than this match. There was no real OMG moment, no one big move that left you sitting in front of your television with your jaw open, and in the end the finish was a little predictable. Kane did his job late on, clearing the way for the bloodstained Orton so he could climb to the top of the ladder and claim the belts. But then, from out of nowhere, Cena appeared, and after taking Kane and Orton down with attitude adjusters he scaled the ladder to claim the belts as his own, much to the annoyance of Mr. & Mrs. Triple H at ringside. 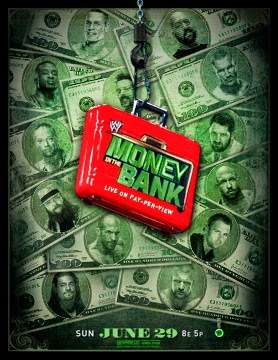 In conclusion - this year's Money in the Bank had it's good and bad points, but overall it was a very entertaining show. The good points came from some of the lesser lights. The show opener was a quality encounter, and the briefcase MITB match was quite good as Seth Rollins proved he's ready for the next level, while the other support matches delivered when needed. But the main event MITB match, although good, was quite predictable at the end. Despite the fact that prominent up and comers like Cesaro, Bray Wyatt and Roman Reigns were involved you could see John Cena's title win coming a mile off, and for me that just took the shine off things a little. As for my prestigious match of the night no-prize I'm going for the Usos/Wyatts Tag Team title match at the very beginning of the show. It was a great example of tag team wrestling. So with all of that out of the way there's just one more thing to do, and that's to give this show the thumbs up.